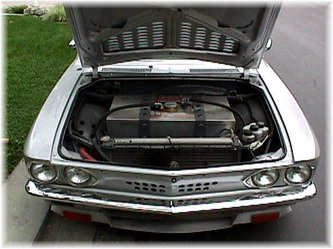 This V8 Vair is among the most modified and sophisticated of any street legal Corvair we have seen. It is perhaps the most notorious as well, considering the original owner, Charlie Rau, spent a lot of money having this car built to resemble a Ferrari. It is for these reasons we think it's significant enough to feature here. The first time the car was shown, it won a Best Engineered award at a Super Chevy Show in Pomona CA circa 1998. 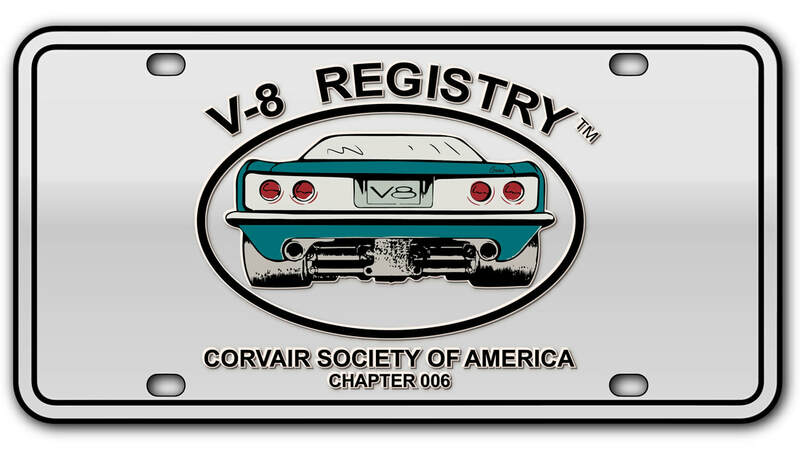 At present, we do not know the current owner or the whereabouts of the car and all the information presented here is from data from the V8 Registry newsletter and the description of the car when it was up for bid on EBay in November 2001, where it stirred a lot of interest in the Corvair community. According to that information, the car had over $75,000 invested in it. The person who wrote the ad copy did not know much about the car. The last known place of residence was Las Vegas NV. The first thing that strikes you about the car, other than the Ferrari tail lights, is the rear lid and window that have been combined to create a large electrically operated hatch back, again taking the cue from Ferrari. 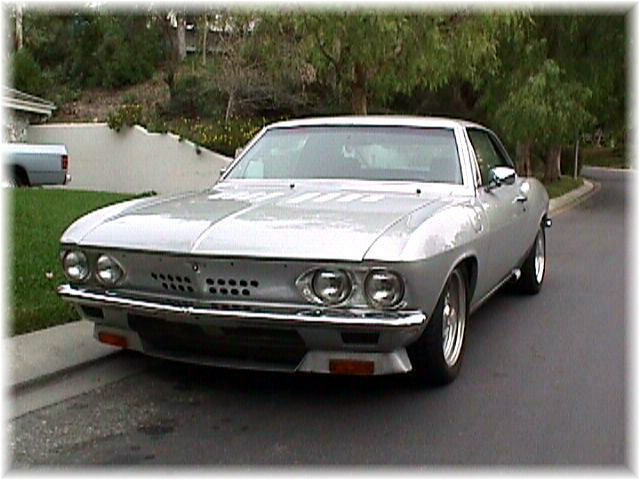 As can be told from the pictures, it appears the car was not finished inside and we do know that when Charlie had it the engine was an injected, turbo charged 500 cubic all aluminum big block Chevy mated to a five speed Mangusta transaxle. 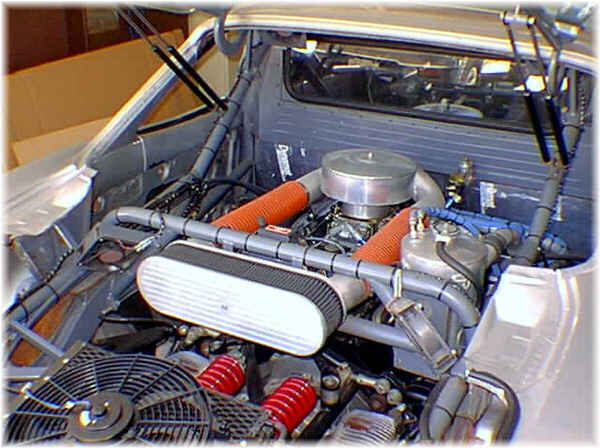 As the current pictures show the engine is a small block 350 Chevy with a Porsche G-50 five speed transaxle. There is a lot of hand fabrication in the air cleaner assembly in attempt to locate it where cool air can be had under the louvered part of the hatch. 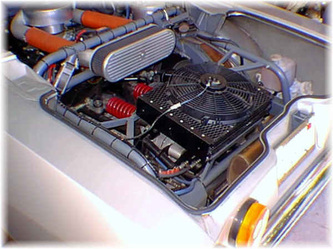 A remote oil cooler with its own fan is mounted at the back of the tube frame. The oil system also has a dual filter setup. There are two small "muffin" fans attached to a crossover bar whose purpose is anyone's guess. These fans are usually found in computers and do not put out much volume. The body has been modified, other than the aforementioned hatch back and tail lights, with a custom front air dam with the usual cut out for cooling air and the original front parking light openings are used as brake cooling inlets. The parking lights have been moved to the lower edge of the air dam. Eighteen holes have been cut in the front grille area for more air and the front lid has eight rows of louvers and the rear lid has six rows. The original gas filler door has been filled in. 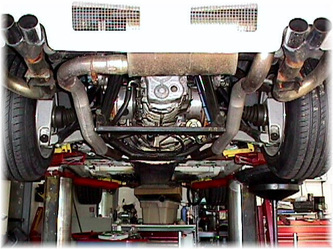 The rear valence panel has dual exhaust cut outs in the bottom edge and the original grille opening has two rectangular screened openings showing the transverse mounted muffler. A small scoop is mounted along the rear section of the rocker panels, possibly for brake cooling. The interior has a custom aluminum center console for the shifter and auxiliary switches. The dash appears stock with aftermarket gauges replacing the stock units and the usual extra three mounted above the radio. A custom steering wheel is mounted on an adjustable column. A set of floor mounted racing style pedals can also be seen. The seats appear to be Reccaro's with harnesses. 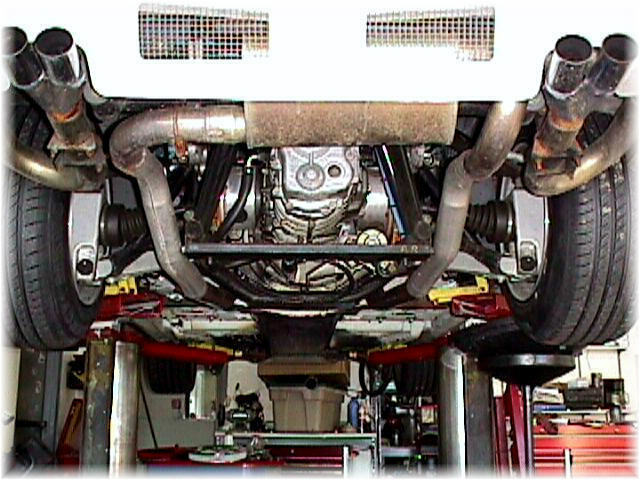 A full roll cage, less door bars has been installed and a full bulkhead with a window separates the driver from the engine compartment. way of a cut out under the front bumper and a series of holes in the front grille panel. Hot air appears to exit through the louvers in the lid and some more holes in the inner wheel wells. Also, in the front compartment is a large fuel cell with a center fill cap. Rows of three remote hydraulic reservoirs are mounted beside the radiator. Two would be for the brakes and one for the hydraulic clutch. Wheels are by Boyd Coddington with low profile tires. The brakes are said to be 11" NASCAR discs up front with Corvette discs mounted inboard at the rear. 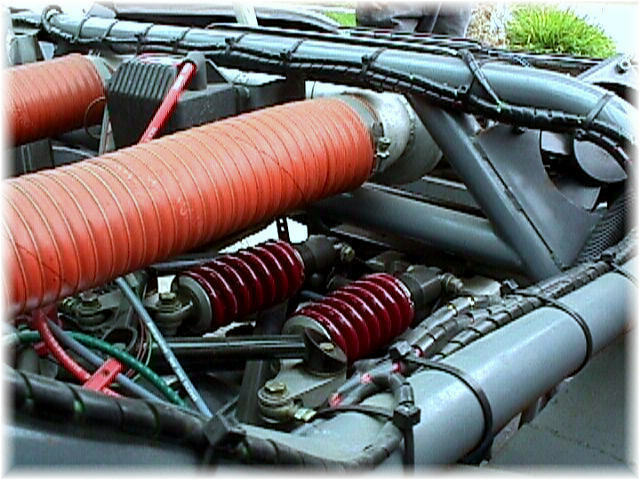 The rear suspension is a very sophisticated Formula One style articulated setup with a coil over shock arrangement mounted horizontally, centered over the transaxle. All of the engine, drive train and suspension pickup points are designed around a cage of high strength round moly tubing.